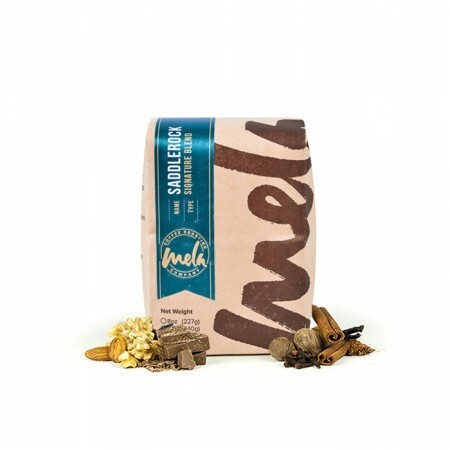 The Saddlerock Blend was blended and roasted for you by Mela Coffee Roasting Company. The Saddlerock Blend features coffees from Ethiopia and Costa Rica. Blended and roasted with the intention to be complex and approachable, this cup has notes of milk chocolate, caramel and deep plum notes as it cools. Direct chocolate forward, almost like liqueur, but as it cools more plum and date hints appear. Maybe we can go back to the lighter roasts. So delicious and smooth! I may put it in my cue again. Great coffee! One of our favorites.Unique flavor. I found this to be a great daily morning coffee; versatile yet flavorful. I especially enjoyed the subtle notes of plum that emerged after sitting for a while. I tried something new and glad that I tried it. However I think it is too light. I'm not so impressed with complex flavors, but like the punch of a good strong coffee. I like to drink Starbuck House blend better than Dunkin D. for example. Excellent. Wonderful blend. I will purchase this coffee again. Took me a few trys to get the brew right but it is a great cup! I think my bag might have been bad, tastes like cigarette ash. Nothing Fancy, but not bad either. Just a decent cup of coffee. Had to slightly up the dose on a v60 to get better results.